Serving traditional comics through new media like mobile phones is not new. GoComics was started back in 2006 and last February Marvel Entertainment announced plans to release their Motion Comics (with enhanced animation and audio) via iTunes. 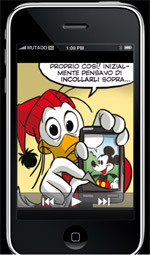 The Walt Disney Company Italy has also had digital Disney comics on their website Disney.it for a while. 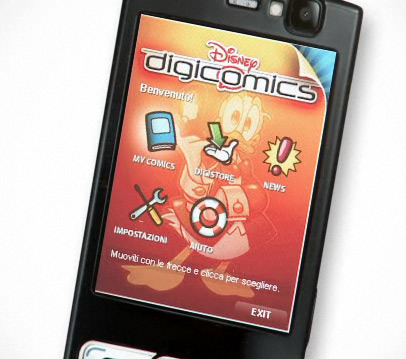 Want to see a demo of these Disney DigiComics in action? I’ve found two: there’s a video interview with the creators on the Adobe Flash Lite website and a more interactive demo on Wired.it. What do you think of this new development? Would you read Disney comics on your mobile phone? This entry was posted on Friday, July 24th, 2009 at 8:57 pm	and is filed under Digital Comics, Italy. You can follow any responses to this entry through the RSS 2.0 feed. You can leave a response, or trackback from your own site.